To Cite: Dehghani M, Monabati A, Sanei M , Davarpanah M A . Visceral Leishmaniasis with Massive Pulmonary Involvement: A Case Report, Int J Infect. Online ahead of Print ; 6(1):e87993. doi: 10.5812/iji.87993. Visceral leishmaniasis (VL) is an endemic disease in East and South Africa and the Mediterranean area. Fever, splenomegaly, and weakness are the most common symptoms of VL, but pulmonary involvement is very rare. The present study reports a patient with VL and pulmonary complication. An 18-year-old immunocompetent patient was referred to a local hospital with submandibular lymphadenopathy, nonproductive cough, and occasional fever. In spiral chest CT scan, bilateral massive bronchopulmonary consolidation with a diffused nodular pattern was seen. After a few days, because of absent response to antibiotic therapy and prednisolone, fine needle aspiration from pulmonary nodules was done that showed multiplex Leishman bodies. The patient showed a good response to amphotericin B and glucantime. Leishmaniasis is an intracellular parasitic disease that is transmitted by the bite of specific sand flies. Leishmaniasis is mostly seen in tropical regions and is rare in other areas. Countries located in Africa, South America, and the eastern Mediterranean such as Iran and Pakistan, are the endemic areas of leishmaniasis (1). Leishmaniasis is classified into three groups: Cutaneous (common form), mucocutaneous, and visceral (uncommon form) (2). According to a report by the World Health Organization, cutaneous and mucosal forms were decreased from 2006 to 2015 (1). Cutaneous leishmaniasis presents itself with secretory or non-secretory wounds, which are chronic in nature. The reparation of these wounds sometimes takes up to four years with sequelae such as scar, pigmentation, and atrophy. The mucocutaneous form usually starts from the nasal mucosa, followed by the mouth and pharynx, and spreads to the skin around the nose and lips. Visceral leishmaniasis (VL) known as kala-azar or black fever manifests the signs and symptoms such as fever, weakness, splenomegaly, and chronic diarrhea. If VL is not treated, in most cases, the patient will die (3, 4). Pulmonary involvement is rare in VL and its misdiagnosis may cause the patient loss. This study reports a case of VL with pulmonary involvement. An 18-year-old man from Shiraz city, Iran, presented with a nonproductive cough and occasional fevers for five months in June 2015. In his past medical history, he did not have any remarkable disease or any drug consumption. He had a fever (39.5°C) and other vital signs were normal. Upon a physical examination, submandibular lymphadenopathy and coarse crackles in both lungs were detected. The abdomen was normal without organomegaly. In fingers, clubbing was also seen. In chest X-ray, massive bilateral pulmonary infiltration was seen, predominately in middle and lower pulmonary lobes. 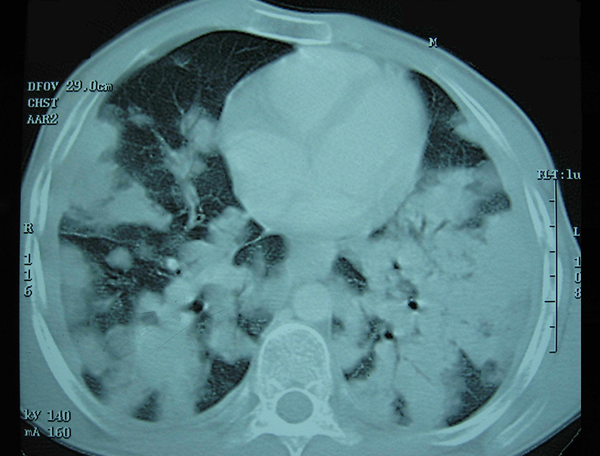 The chest spiral CT scan confirmed the mentioned result without any pleural effusion and lymphadenopathy. In laboratory tests, he had normochromic normocytic anemia and elevated ESR. He was initially diagnosed with pneumonia. Then, he was admitted and intravenous antibiotics including ceftriaxone and vancomycin were given but with minimal clinical improvement for four days. During the period of surveillance, submandibular lymphadenopathy and pulmonary infiltration were persisted. In the next step, an excisional lymph node biopsy from the cervical lymph node was done that showed infiltration of plasma cells and lymphocytes, consistent with Castleman disease. Therefore, the patient was discharged with prednisolone. After seven days, he came back to the hospital with severe shortness of breath and peripheral cyanosis. The chest CT scan showed multiple nodules in both the lungs without significant enhancement in the dynamic study with paratracheal lymphadenopathies (Figure 1). 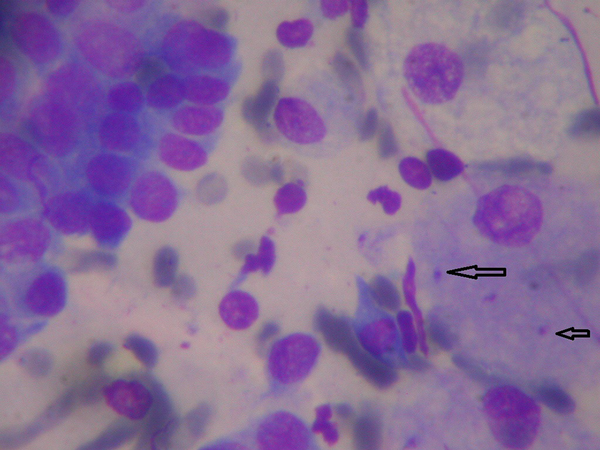 Cytological evaluation by fine needle aspiration from the pulmonary lesions under the guide of CT scan showed numerous Leishman bodies (Figure 2). In laboratory tests, PCR for Leishmania was positive, the titer of immunofluorescent antibody (IFA) for kala-azar was 1:1024, and the albumin/globulin ratio was 0.3. In addition, HIV, P-ANCA, C-ANCA, and PPD tests were negative. The patient was treated with amphotericin B (1 mg/kg daily), along with potassium supplement for three weeks and then glucantime for 10 days. After a few weeks of treatment, the patient improved gradually and the ESR was declined. 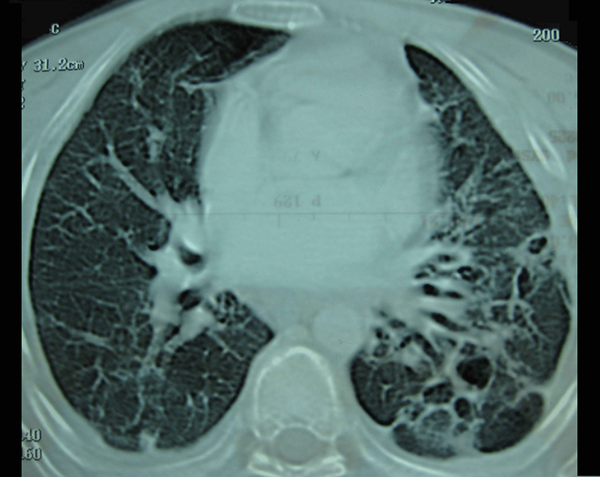 A spiral chest CT scan after three months showed the disappearance of lung nodules, but multiple thin wall cavities with surrounding infiltration, interstitial thickening, and pneumatocele formation at the base of both lungs were considerable (Figure 3). After 12 months, the patient was in good general condition and had a normal ESR, but complained of an occasional cough. The patient was informed about this report. Almost all patients with VL have chronic signs and symptoms. Fever, weakness, abdominal pain, mucosal bleeding, and splenomegaly are the most common findings in VL. Hepatomegaly is seen in more than half of the cases. Pancytopenia, bicytopenia, or monocytopenia is detectable in about half of the cases with VL (5). Pulmonary involvement with remarkable symptoms in immunocompetent patients with VL is a rare presentation (5-7). Less than 6% of immunodeficient VL patients with and without respiratory signs and symptoms show radiologic changes in chest X-ray or chest CT scan (5). According to available evidence, interstitial pneumonia is a predominant histologic pattern of lung involvement in VL and the Leishman body is detectable in alveolar macrophages in only 23.1% of the cases (8). As seen in the present study, pulmonary involvement in VL has a bronchoalveolar pattern (9), which is similar to bacterial pneumonia. In addition, the distributed nodular pattern was reported in only a person with VL and HIV/AIDS (6). Conversely, our patient did not have immunodeficiency. In the review of the literature, there are limited reports about lung or bronchial tree involvement in patients with VL. Kotsifas et al. reported a 40-year-old man with cachexia, night sweats, coughing, hemoptysis, lymphadenopathy, and hepatosplenomegaly. The patient had chronic active hepatitis B and was HIV-negative. In bronchoscopy, inflammatory polypoid lesions were observed that were positive for Leishmania amastigotes in the biopsy specimen. The fluorescent antibody titer of Leishmania was ≥ 1/640 and the patient was treated with intravenous liposomal amphotericin B (10). Marshall et al. reported a 39-year-old Sudanese man living in the UK who had a cough, shortness of breath, and two episodes of life-threatening hemoptysis. In imaging, there were splenomegaly and mediastinal lymphadenopathy. In bronchoalveolar lavage and histology, there was evidence of chronic inflammation. In the peripheral blood smear and serology, the parasite and its antigens were not detectable. Ultimately, Leishmania was confirmed by PCR and the patient was treated with amphotericin B successfully (11). Shweta et al. reported a 48-year-old man with fever, loss of appetite, weakness, abdominal pain, and splenomegaly. Bone marrow and peripheral blood smear were positive for Leishmania amastigotes. The patient received 15 injections of amphotericin B deoxycholate. Chest X-ray showed a prominent bronchovascular marking and pleural effusion (12). Dasgupta et al. reported a 62-year-old patient with coughing and chest pain. The patient had splenomegaly and normal lung sounds. The patient presented with anemia and left pleural effusion. In bone marrow and peripheral blood smear, Leishmania amastigotes were observed. Intravenous sodium stibogluconate started and pleural effusion resolved after one month (13). The patient in the present study was examined for HIV and tuberculosis since Leishmania is common in these cases (5-7, 14). Moreover, VL or its treatment may cause the incidence of pulmonary tuberculosis, which requires special treatment of the patient (12, 14). The biopsy of the lymph node, lung lesions, and a peripheral blood smear may be negative for VL detection in some cases (8). Fortunately, pulmonary biopsy and serology revealed VL for our patient. In suspected cases with negative results of initial evaluations, PCR or biopsy of the bone marrow, liver, and spleen may be helpful for confirming VL (5, 11). In addition, bone marrow biopsy can help reject malignancy if there is unexplained blood cytopenia. Bleeding, multiple organ failure, and bacterial infections are the main causes of death in patients with VL (15). In addition, treatment with antimony drugs can interfere with patient viability (16, 17). In this study, treatment initially began with amphotericin B and then continued with glucantime, which is an antimony drug. It seems that the use of amphotericin B in the first step of treatment is appropriate in terms of reducing the probability of morbidity and mortality. In a case report, treatment with intravenous meglumine antimoniate (10 mg/kg) was accompanied by shock and death after six hours. Paying attention to immediate reactions such as anaphylaxis or delayed reactions such as Janisch-Herxheimer after administration of antimony compounds is important (17). According to the review of cases with pulmonary involvement due to Leishmania, we concluded that a cough, hemoptysis, pleural effusion, mediastinal lymphadenopathy, polypoid mass in the bronchial tree, and pneumonic infiltration are the most common findings in VL with respiratory system involvement. These findings should be considered in endemic areas as alarming signs and symptoms for pulmonary involvement by Leishmania. However, the findings of this study showed pulmonary involvement with diffuse bronchopulmonary or nodular pattern, even in endemic areas, may be an uncommon manifestation of VL. Conflict of Interests: The authors declare that there are no conflicts of interest. Patient Consent: The patient was informed about this report. 1. mondiale de la Santé Organisation; World Health Organization. Global leishmaniasis update, 2006–2015: A turning point in leishmaniasis surveillance–Le point sur la situation mondiale de la leishmaniose, 2006-2015: un tournant dans la surveillance de la maladie. Wkly Epidemiol Rec. 2017;92(38):557-65. 3. Desjeux P. Leishmaniasis. Public health aspects and control. Clin Dermatol. 1996;14(5):417-23. doi: 10.1016/0738-081X(96)00057-0. [PubMed: 8889319]. 4. Torres-Guerrero E, Quintanilla-Cedillo MR, Ruiz-Esmenjaud J, Arenas R. Leishmaniasis: A review. F1000Res. 2017;6:750. doi: 10.12688/f1000research.11120.1. [PubMed: 28649370]. [PubMed Central: PMC5464238]. 5. Chakrabarti S, Sarkar S, Goswami BK, Sarkar N, Das S. Clinico-hematological profile of visceral leishmaniasis among immunocompetent patients. Southeast Asian J Trop Med Public Health. 2013;44(2):143-9. [PubMed: 23691621]. 6. Herrejon A, Cervera A, Macia M, Ferrer R, Blanquer R. [Bronchioloalveolar adenoma associated with bronchiolitis obliterans and leishmaniasis with lung involvement in acquired immunodeficiency syndrome]. Arch Bronconeumol. 2005;41(4):233-5. Spanish. doi: 10.1157/13073174. [PubMed: 15826534]. 7. Nigro L, Montineri A, La Rosa R, Zuccarello M, Iacobello C, Iacobello C, et al. Visceral leishmaniasis and HIV co-infection: a rare case of pulmonary and oral localization. Infez Med. 2003;11(2):93-6. [PubMed: 15020853]. 8. Duarte MI, da Matta VL, Corbett CE, Laurenti MD, Chebabo R, Goto H. Interstitial pneumonitis in human visceral leishmaniasis. Trans R Soc Trop Med Hyg. 1989;83(1):73-6. doi: 10.1016/0035-9203(89)90712-8. [PubMed: 2690420]. 9. Totan M, Hokelek M, Cetinkaya MC. Five pneumonia cases associated with visceral leishmaniasis in Turkey. Int Pediatr. 2003;18(3):185-7. 10. Kotsifas K, Metaxas E, Koutsouvelis I, Skoutelis A, Kara P, Tatsis G. Visceral leishmaniasis with endobronchial involvement in an immunocompetent adult. Case Rep Med. 2011;2011:561985. doi: 10.1155/2011/561985. [PubMed: 21577261]. [PubMed Central: PMC3090634]. 11. Marshall BG, Kropf P, Murray K, Clark C, Flanagan AM, Davidson RN, et al. Bronchopulmonary and mediastinal leishmaniasis: An unusual clinical presentation of Leishmania donovani infection. Clin Infect Dis. 2000;30(5):764-9. doi: 10.1086/313763. [PubMed: 10816146]. 12. Shweta , Bhatnagar S, Gupta AK, Murti K, Pandey K. Co–infection of visceral leishmaniasis and pulmonary tuberculosis: A case study. Asian Pac J Trop Dis. 2014;4(1):57-60. doi: 10.1016/s2222-1808(14)60315-7. 13. Dasgupta S, Saha M, Chakrabarti S, Chakraborty J. Visceral leishmaniasis with pleural effusion in an immunocompetent patient. Lung India. 2014;31(1):56-8. doi: 10.4103/0970-2113.125913. [PubMed: 24669085]. [PubMed Central: PMC3960813]. 14. Colomba C, Adamoli L, Trizzino M, Siracusa L, Bonura S, Tolomeo M, et al. A case of visceral leishmaniasis and pulmonary tuberculosis in a post-partum woman. Int J Infect Dis. 2015;33:5-6. doi: 10.1016/j.ijid.2014.12.020. [PubMed: 25522871]. 15. Costa CH, Werneck GL, Costa DL, Holanda TA, Aguiar GB, Carvalho AS, et al. Is severe visceral leishmaniasis a systemic inflammatory response syndrome? A case control study. Rev Soc Bras Med Trop. 2010;43(4):386-92. doi: 10.1590/S0037-86822010000400010. [PubMed: 20802936]. 16. Ahasan HA, Chowdhury MA, Azhar MA, Rafiqueuddin AK, Azad KA. Deaths in visceral leishmaniasis (Kala-azar) during treatment. Med J Malaysia. 1996;51(1):29-32. [PubMed: 10967976]. 17. Garcia-Cordoba F, Ortuno FJ, Segovia M, Gonzalez Diaz G. Fatal visceral leishmaniasis, with massive bone-marrow infection, in an immunosuppressed but HIV-negative Spanish patient, after the initiation of treatment with meglumine antimoniate. Ann Trop Med Parasitol. 2005;99(2):125-30. doi: 10.1179/136485905X19810. [PubMed: 15814031].